So it's Tuesday and one of my two days off this week :) despite it being my day off I was up bright and early to head to Pinky's Nail bar in Stirling, so my friend Kelly (who owns Pinky's) could work some galactic magic on my nails! I used to be addicted to getting my nails done and always had gel or acrylics with crazy nail art, I got my acrylics taken off in July and since then have grown my natural nails and I'm happy to say they are naturally really strong! People often ask me if they're false nails :) as I often have bright and or glittery nail polish or nail art on my natural nails. So pretty! and actually not as hard as you'd think! 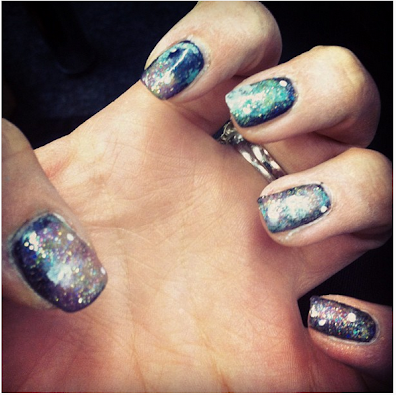 These have to be the most gorgeous 'galazy' looking nails I've ever seen! So gorg! Thank you for sending me your link during #bbloggers chat! I can't wait to see your tutorial!